I think one of my rats, dexter, was a victim of mega colon. Is it common among males at all? He had a distended stomach and was massive. He hardly ever had a BM as well, and passed peacefully. MC doesn't discriminate between the sexes. It sounds like Dexter had late onset MC...between 5-10 months it shows up fast and is usually fatal. I am sorry your boy died. Dexter was a lab rat and as far as I know it happened after 10 months, a little after a year I do believe. Is it possible for it to happen late like that? It can. MC rats can have late onset show up. Some just have horrible malabsorption problems and others die. I had posted before in another post about Megacoloen which is on Blazed or wedged faced rats. High whites yes as well for mice its a color called lethel Yellow which is hard to tell from safe yellow which the only way really is to watch them when they reach 3 to 4 months old Lethel yelow will get big almost prego looking becuase they can develop thyrodie and diebeties among other things. Some dont show a sign and sometimes you have to breed to find out if they all are yellow or most the litter then that could very will be a lethel yellow in mice. but there are soem health probelms with mice that you can not cure but they can taek meds for. The rats with The white plaze I have a few and have breed some. My 1st were 2 blazed faced before any breecers or anyone told me about mc all are 7 months old and doing well but I was lucky no one had probelmes. 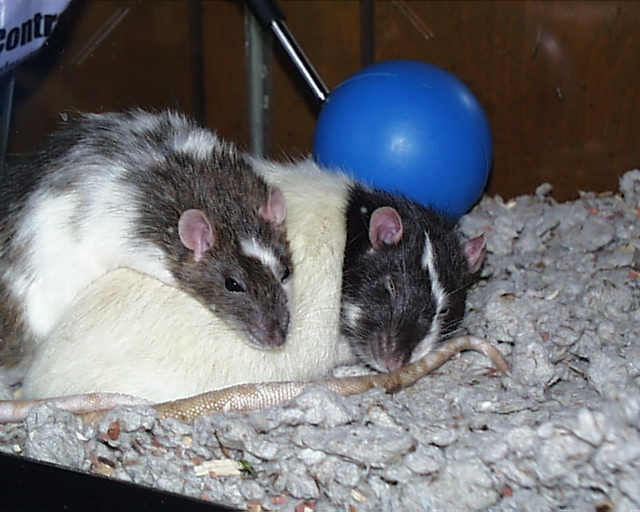 If you have a blaze fcaed rat or hight white and you do breed it breed it to a solid or a hood that had maybe a spot on the head or none at all. Blaze faces come up in lines and litters so if you breed and they all have blazes you might want to maek shure that line is ok. There is one breeder out in LA that breeds the patched and blazed rats but she carfuly pics out the blazes to breed. I breed blaze to plain or solid or hoods but not a blaze to a blaze unless I know what is from the family back ground. Not all of them have it in PA here we never head of it and have only had a few cases from a couple tha thad gotten rats of of poor breeders or feeders. or moved here with them. Go to meet up groups to the New yourk city Rat meet up you'll find Raquel the moditrater She can tell you the indepth of Megacolen I know she has a artical some were or I can see if she can send it to me and I can post it. Which exspalines every little detail to a t. or send me the link to it. I use to have it but cant find it. the AFRMA may have stuff on the mice if you want to look them up for those of you that have mice. I found my info on the fun mousery then just sertche dhte web for more infor on the subect of Lethel Yellow and other stuff. This is not something that is new its been around for a while Raquel told me that she has known about it for a while but its becomeing more and more aperent. 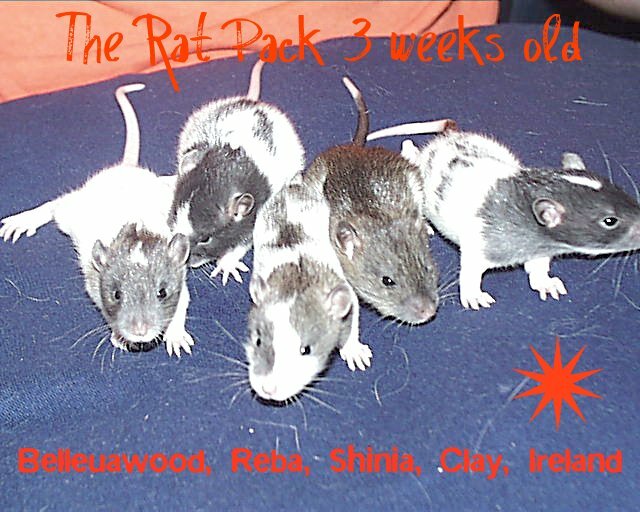 Look at my site and my Blazed faced rats they all are fine and no probelm but if and when breed get breed to a rat that has no blaze or dont have to many blazes that have showen up in the litters, as in in the back ground. There is some breeders that are focusing on the blaze faced and high whites to breed the problem out of them so this way they are not suffering. And they can pinpoint were, how and why this probelm has ocured and what can be done to avoid it or get it out of the lines. BUt thank you for posting it. I did nto relized that there were so many others that didnt not know this like me when I 1st started out. also on there is a link to the AFRMA at the bottom of the home page I think they also have info on the subject. The parents are below but they only had 3 babies with blazes only 2 are shown on this pic the other blazed in Tattioe but she is alco considered a miss marked patched rat. and taj is missing he ha a head spot. ps the one with the name shina turned out to be a boy his man hoods droped late. Is late-onset megacolon fast or slow growing? If i post a picture on here of a rat, are you guys able to tell the difference between a fat rat and a megacolon rat? I think my friend's rat might have late onset rather than be obese because i noticed that in the time span that louna had time to poop 3 times, she only pooed once, and the poos are twice the size of louna's and pretty dry. I'm gonna watch it over the next 5 days, because maybe she's just toilet corner shy since she doesn't know my place yet and doesn't feel at home. Last edited by Dustette; 12-11-2009 at 11:04 PM. Put your pic up...but if you can feel her its best...it would feel lumpy and wrong, but the pooping is abnormal.. is it worsening? she just feels really bloated compared to louna, with her skin not too tight around it, but it's kinda like a water balloon or something. My camera is all out of batteries, but i'm charging it tonight and will post pics tomorrow! was it sudden? she may have several things...MC feels more like hard lumps under the skin, whereas a fat bloated feeling could be Lots of things. How old is she? she's just over a year old, and she has been this fat without worsening since more than 6 months. I saw her when she was just 2 or 3 months old, and then I didn't see her until august 2009, where she was really fat already. So to me she started being fat when she stopped growing, and she had a tiny tiny cage so I thought it was lack of exercise. I felt her belly again, and it just feels bloated, no hard lumps, and she poos ok in the end, less than louna, but she doesn't seem blocked. However, she doesn't eat that much since a while because my friend started rationing her portions, and doesn't give her any sweet or salty treats. She has had a bigger cage for a month or 2 and still, no weight loss. I don't know how fast it's supposed to go with rats. It takes months once you have a fat rat, I wouldn't worry too much. All of a sudden you will see a loss of weight, and it continues from there. it's true that now i look at the pictures and she doesn't seem so big. It's more when I handle her I really see the difference with Louna, and it really hits me! She just looks like a fat rat to me.